TWEETS AS THE GERMS OF REVIEWS? Here is an interesting thought piece on the (so far limited) trend of encouraging audience members to tweet during performances. Author Tom Jacobs frames the basic question well: "Who, really, is more engaged? Is it the audience member holding a screen and responding to the action with his thumbs, or the one sitting silently in the dark with her eyes glued to the stage?" If you're not patient enough to read the entire article, I'll reveal that Jacobs finds an expert on each side of the issue, so you'll have to draw your own conclusions. It occurs to me that tweeting can be rather like what I did during my years as a music and theater critic. Instead of zapping out 140-character observations to a handful of Twitter followers, I would jot down notes that within a few hours I would incorporate into a formal review for publication. Of course there are huge differences, in terms of depth and length, between tweets and reviews, but the common ground is the act of jotting down the note. Some of my colleagues would take page after page of notes; I tended to fill up only whatever white space I could find on the printed program with a few phrases. I would write down some idea as it came to me, so I could get it out of my head and continue to focus on the performance. If I spent too much time trying to come up with some nifty metaphor on the spot, that's what I'd wind up concentrating on, rather than the performers on stage. So note-taking for me was a quick distillation of something I'd noticed through close focus on the performance, and something to which I devoted as little time as possible; the sorting-out would come later, when I'd have more time (and fewer distractions) for reflection and mental organization. Tweeting during a performance could serve the same function ... or it could be just another way for an individual to center the event on his own shallow moment-to-moment reactions. When you go to a performance, is the occasion about the art, or is it about you? That's a question that can be asked about critics as well as about Twitter users. Sequestration – an unfortunate word that we all have gotten to know intimately in the past year, and a looming reality that will affect the fiscal health of all public media outlets across the nation, including Arizona Public Media. In fiscal year 2012, AZPM received 12% of its funding in the form of a grant from the Corporation for Public Broadcasting (CPB). Now it is almost certain that an across-the-board cut will reduce AZPM’s CPB grant. Due to the unclear nature of the actual amount that will be cut from the overall budget (projections range from 5.1% to 8.2%), CPB plans on issuing checks in March based on the final reduction. What does this all mean to our services? It means we need your support this month during AZPM’s Spring Membership Pledge Drive as AZPM works to raise more dollars locally to support program services. March highlights include the premiere of a new My Music program, “A 60’s Pop Flashback: Hullabaloo” on Saturday, March 2nd at 9 p.m., Great Performances: “Andrea Bocelli: Live in Portofino” on Sunday, March 3rd at 8 p.m., “Chris Mann in Concert: A Man for All Seasons,” on Sunday, March 10th at 6:30 p.m., “Aaron Neville: Doo Wop: My True Story” on Tuesday, March 12th at 8 p.m., and “Joe Bonamassa: An Acoustic Evening at the Vienna Opera House” on Saturday, March 16th at 8 p.m. AZPM is very fortunate to be one of the few stations in the country to offer the chance to win a Joe Bonamassa autographed Les Paul Special II electric guitar. Tune-in and watch this special on Friday, March 8th at 9 p.m. or Saturday, March 16th at 8 p.m. for your chance to win. “Blenko Glass: Behind the Scenes,” a brand new program airing on March 4th at 8 p.m., takes viewers into the heat and heart of the Blenko glassworks, a renowned family owned and operated artisan glassware company since 1893. Each weeknight don’t forget to watch the new AZ Illustrated news-magazine program at 6:30 p.m. followed by PBS NewsHour at 7 p.m., and on Thursdays we continue to air the popular Doc Martin series at 9 p.m. Tune in and support AZPM so that we may continue to bring you more original, entertaining, and inspirational programs across all our services. Spring also brings ‘daylight savings time’ for most of the country on March 10th. 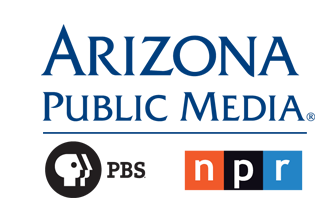 So that we can continue to provide you with up to date news from Talk of the Nation, please make note that the time change will shift a few of your favorite NPR 89.1FM radio programs. Starting on Monday, March 11th, Talk of the Nation will begin at 11 a.m. and Fresh Air with host Terry Gross will move to 1 p.m. Additionally, the Market Place morning reports will shift from 5:50 and 7:50 a.m. to 6:50 and 8:50 a.m. On Classical 90.5, select Metropolitan Opera Series programs will start an hour earlier. Be sure to check our website for broadcast start times at azpm.org/classical. On March 31st at Noon, Classical 90.5 will broadcast the From the Top with Christopher O’Riley concert that was taped live here in Tucson in February. It features two local young performers, Augustus Woodrow-Tomizuka and Cameron Williams. Visit here for the full story. The Tucson Festival of Books comes to the University of Arizona on March 9th and 10th. AZPM is proud to be a part of this event with our focus on popular PBS Kids characters; Buddy from Dinosaur Train, Curious George and Clifford the Big Red Dog. All three PBS Kids characters will be featured at the 2013 Storybook Character Breakfast and Parade on Saturday starting at 8 a.m. Kids can meet Buddy and Curious George in person at the Science City Bookstore tent, and participate in interactive crafts. Visit here for appearance details. On behalf of all of us at AZPM, thank you for your viewership, listenership, and continued support. Getting legitimate foreign artists into the United States and Great Britain has been ridiculously difficult during the past decade of paranoia, and now even Israel is getting into the act of impeding the travel of well-known musicians. According to this report, conductor Gustavo Dudamel was recently detained while entering and exiting Israel. But there's a suggestion that the harassment stems from Dudamel's Venezuelan citizenship, and Israeli officials hate Venezuela because Venezuela is cozy with Iran, which Israeli officials also hate. Read the blog post and follow its internal link for more on the conspiracy theory, but while you do that, pause to wonder if the Los Angeles Times bothers to copyedit its bloggers. This fellow twice refers to the "Israeli" Philharmonic (it's Israel Philharmonic, which he at least gets right in a quote), and Norman Lebrecht's name is not spelled "LeBrecht." I do wish newspapers would take as much responsibility for their blog posts as they do for print articles, and for that matter police their comments sections as carefully as they do published letters to the editor. Thanks to the outstanding support of people like you, Arizona Public Media completed a successful calendar year-end campaign, exceeding our $145,000 goal. Your member dollars are an investment that makes possible the enriching local and national news and entertainment programs that we broadcast throughout the year. Thank you. We hope you will join us in welcoming From The Top with host Christopher O’Riley for a live taping of this hit NPR radio program showcasing America’s best young classical musicians. The live show will feature two young Tucson musicians on Sunday, February 17th at Centennial Hall, presented by our colleagues at UApresents. Visit azpm.org for more information. From The Top airs at Noon on Sundays on Classical 90.5. Arizona Illustrated, Southern Arizona’s weeknight news magazine series for over 30 years, and the flagship local TV production for Arizona Public Media (AZPM,) has undergone a makeover. The new AZ Illustrated (pronounced A-Z-Illustrated) debuts in its regular weeknight time slot at 6:30 p.m. on Monday, February 4, 2013. The new AZ Illustrated features different hosts and topics each night of the week – Metro, Science, Nature, Arts and Politics – offering insight and discussion relevant to Southern Arizona audiences. Tapping into the wealth of talent and experience of AZPM’s award-winning producers, reporters, and production team, while introducing new specialists from the community, the series will feature new voices, new stories and a new focus. Metro Mondays, with host Maria Parham, covers education, business, government, and the policies that affect our daily lives. Science on Tuesdays explores issues and advances in health, science, and technology with host Jane Poynter. On Wednesdays, Nature host Georgia Davis presents the environmental news and issues unique to our desert landscape, and on Thursdays, embrace the vibrant cultural community that is distinctly Southern Arizona with Arts host Elizabeth Burden. Jim Nintzel, host of Politics on Friday, provides in-depth analysis of the week’s political news. For more AZ Illustrated information, visit here. Other programming highlights in February include an extensive lineup of special programming in observance of Black History Month on PBS 6, World and NPR 89.1. Highlights include “Black Kungfu Experience” on February 11th, Independent Lens: “The Powerbroker: Whitney Young’s Fight for Civil Rights,” and American Masters: “Sister Rosetta Tharpe: The Godmother of Rock and Roll.” For a complete list of programs and airdates, visit here. On behalf of all of us at AZPM, thank you for your viewership, listenership and continued support. Our efforts for the benefit of Southern Arizona would not be possible without you. (1) Metro Cume audience persons, age 12+, Fall 2011, Fall 2012, ©Arbitron, Inc. ©Radio Research Consortium, Inc.
(2) Metro Average Quarter Hour share, age 12+, Fall 2011, Fall 2012, ©Arbitron, Inc. ©Radio Research Consortium, Inc.
(3) Nielsen Company, Tucson (Sierra Vista), AZ, November 2012 compared to previous Fall survey, November 2011. Last weekend, I had such a bad coughing fit at the beginning of a Chamber Music Plus performance that I had to go home and take some Mucinex before I was fit for the second half. It turns out that I'm not the only culprit: A German economist (appropriately named Wagner) has determined that people do, indeed, cough more at classical-music concerts than at other performances, and especially during certain kinds of music. “It is the more modern pieces of 20th century classical music, it is the more quiet and slow movements that are interrupted by coughs,” Wagner says. “It is also non-random, in that coughing sometimes appears to occur in sort of avalanches or cascades through the audience so there are some patterns.” There isn't much to go on, but you can read this news item and think about carrying cough drops to your next concert. ARE YOU KEEPING UP WITH KEEPING UP APPEARANCES? 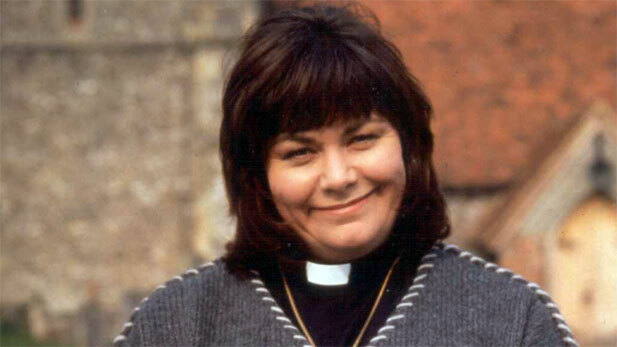 Dawn French is the hilarious Reverend Boadicea Geraldine Granger aka the Vicar of Dibley! In the summer of 2011, I changed up the BritCom lineups on Saturdays and added some shows on Thursdays. Emails, calls, blog comments and Facebook postings came in droves from viewers. All feedback is valuable to me, but it definitely showed that our viewers’ tastes have shifted and are slightly divided! Hollywood at Home and Doc Martin Fans Rejoiced! Fans came out of the woodwork when we launched the Hollywood at Home series in Fall 2011 on Saturdays at 9pm. Those films have consistently been our top rated shows in any given sweeps month. Doc Martin premiered on Thursday, September 20th, 2012 at 9pm after a year of die-hard fans contacting me about bringing it to Southern AZ. Imagine the hurrahs when we found the money in the budget to buy it for AZPM! Staff tell me that people mention their love for Doc Martin to them all the time. This feedback is significant because viewers rarely contact us because they like something, so when someone takes that time to express love for a show, we know we have a winner. So far, we are happy with the audience numbers (56% more viewers on Thursdays compared to Nov. 2011). We even kept the show on during this past pledge drives and people donated money in honor of Doc! Now that the Hollywood at Home series has legs on Saturdays, and Doc Martin has spiked up our Thursday nights, it is time to look at what we air before and after. Let’s start with the easier night—Thursdays. A few years ago, PBS had Nature on Sundays and we repeated that show on Thursdays at 8. It worked great. Nature moved to Wednesdays, and suddenly the Thursday repeat didn’t make sense. We have been working on that night ever since. Last summer we experimented with dramas and newer comedies on Thursdays starting with some strong Masterpiece episodes that we called The Men of Mystery! 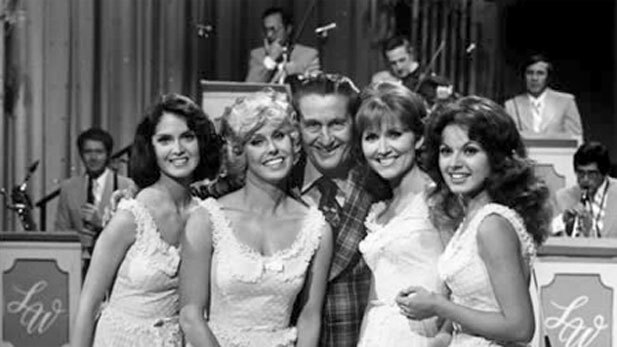 The response to certain episodes showed us that people welcomed less traditional dramas. We also aired “saucier” BritComs later on Thursday nights that didn’t quite fit on Saturday’s lineup with Keeping Up Appearances. The clear fan choices were People Like Us, Worst Week of My Life and Coupling. Outnumbered is a series people either love or hate. The love is pretty strong so we are keeping it on for now and besides, the new season is hilarious! When appropriate, we will put PBS drama specials leading up to Doc in that 8pm slot like the wildly popular Call the Midwife series. We just launched a new-to-AZPM series from the BBC called Death in Paradise** on Thursday, January 3rd at 8pm, and we hope you check it out if you haven’t already! Watch a promo here. Sara Martins is the Detective Sergeant Camille Bordey and Ben Miller is the Detective Inspector Richard Poole in Death in Paradise. When the new season of Call the Midwife starts again, we will hold that series for Thursday nights later in the summer. Okay, I avoided writing about Saturdays long enough. In short, we are looking at bringing back some comedies like Vicar of Dibley and Waiting for God. I will likely phase out Keeping Up Appearances or As Time Goes By with one series, and a few months later, swap out the other. This is to ease the pain of those fans who never want those shows off the air. We learned that after Hollywood at Home, it is too late for folks who love the traditional BritComs. We will continue to air dark comedies like Black Books, Worst Week and the like. I’d love to try another comedy but it is too early to talk about it! I’m still in “research” mode which really means a weekend on my couch watching TV while avoiding chores. Arizona Public Media broadcast stations are licensed to the Arizona Board of Regents. Arizona Public Media and AZPM are registered trademarks of the Arizona Board of Regents.